First, the format wars are over. Blue-Ray won. Now you can finally go out and buy that next generation DVD player to go with your new flatscreen. Second, is there a price war coming to cell phone plans? A delicious, delicious price war? There have been rumors than someone was going to jump the gun and begin offering one price for everything unlimited wireless plans. Today, Verizon pulled the trigger, though it might not be all you hoped for. The day we can stop counting minutes, bytes and text messages might still be aways away… but lets hope it’s coming. This could put pressure on the other carriers to follow suit. PRICE WAR! 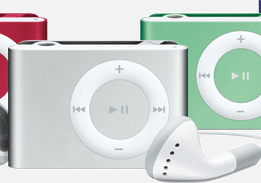 Finally, you can now score an Ipod Shuffle for $50. If that’s your bag.